I. Understanding the healing rate and progression of the ACL graft. The ACL graft undergoes a process of remodeling known as “ligamentization” which can be defined by different phases. There is an early phase with central graft necrosis and hypocellularity followed by a phase of proliferation 10. One key point in the early phase of healing occurs at 6-8 weeks when the graft is at its weakest point 7. After this, remodeling and revascularization of the ACL graft can last anywhere from 6 to 12 months with maturation of the graft taking up to 2 years 3. You also have to take into consideration the type of graft that was used. Escamilla et al showed that bone patellar bone autograft fixation strength can take anywhere from 6 to 8 weeks with soft tissue grafts taking up to 12 weeks 4. If using an allograft, fixation and maturation may be delayed for a longer period of time. II. Training for equal weight bearing with basic and advanced squat activities early in the rehab. This compensation could compromise the affected limb’s abilities to develop appropriate strength, proprioception, and stability while adding more work and increasing the risk of injury of the unaffected side. III. Don’t overemphasize training your patient on unstable versus stable surfaces. It’s no secret that quadriceps strength is important for ACL rehab. Kyritsis et al found that a decreased hamstring to quadricep ratio was one of two factors associated with increased risk of ACL graft rupture 6. Grindem et al showed that more symmetrical quadriceps strength prior to return to sport significantly reduced the knee injury rate 5. Physical therapists usually use a combination of training on unstable versus stable surfaces for ACL rehab. However, sometimes physical therapists spend an inordinate amount of time training patients on unstable surfaces for more lower extremity stability. Training on unstable surfaces is important for getting more global and core muscle recruitment and improving proprioception and balance. However, research shows that there is a decrease in force production capabilities under unstable conditions 1,2. Unstable surface training could not only decrease muscle specificity but limit your patient’s abilities to use heavier loads to maximize force production during exercises. This could limit their hypertrophy training and subsequently impair their abilities to perform higher level sports movements (i.e. running, jumping, deceleration, etc.). So, keep in mind a few things. Be cautious with your patient at 6 to 8 weeks post-operative and get information from the surgeon about what type of graft was used. Make sure that your patient can not only squat with equal weight, but also squat with no compensations with any type of load. Finally, balance out training on unstable versus stable surfaces to make sure you don’t limit your patient’s abilities to maximize their hypertrophy training during their rehab. You can learn more about developing a successful ACL program from my course A Comprehensive Approach to Sports Rehab. Click here! Chulvi-Medrano, I., García-Massó, X., Colado, J. C., Pablos, C., de Moraes, J. A., & Fuster, M. A. (2010). 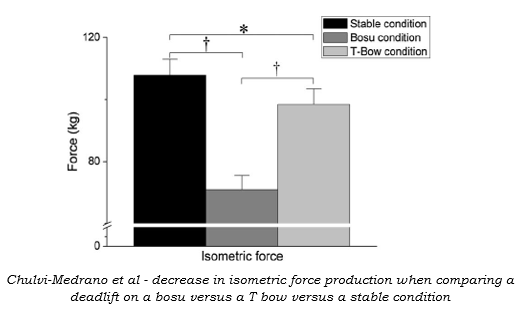 Deadlift muscle force and activation under stable and unstable conditions. The Journal of Strength & Conditioning Research, 24(10), 2723-2730. Escamilla, R. F., Macleod, T. D., Wilk, K. E., Paulos, L., & Andrews, J. R. (2012). Anterior cruciate ligament strain and tensile forces for weight-bearing and non-weight-bearing exercises: a guide to exercise selection. The Journal of orthopaedic and sports physical therapy, 42(3), 208. Kyritsis, P., Bahr, R., Landreau, P., Miladi, R., & Witvrouw, E. (2016). Likelihood of ACL graft rupture: not meeting six clinical discharge criteria before return to sport is associated with a four times greater risk of rupture. Br J Sports Med, bjsports-2015. Manske, R. C., Prohaska, D., & Lucas, B. (2012). Recent advances following anterior cruciate ligament reconstruction: rehabilitation perspectives. Current reviews in musculoskeletal medicine, 5(1), 59-71. Neitzel, J. A., Kernozek, T. W., & Davies, G. J. (2002). Loading response following anterior cruciate ligament reconstruction during the parallel squat exercise. Clinical Biomechanics, 17(7), 551-554. Paterno, M. V., Rauh, M. J., Schmitt, L. C., Ford, K. R., & Hewett, T. E. (2014). Incidence of second ACL injuries 2 years after primary ACL reconstruction and return to sport. The American journal of sports medicine, 42(7), 1567-1573. Scheffler, S. U., Unterhauser, F. N., & Weiler, A. (2008). Graft remodeling and ligamentization after cruciate ligament reconstruction. Knee Surgery, Sports Traumatology, Arthroscopy, 16(9), 834-842. Sousa, P. L., Krych, A. J., Cates, R. A., Levy, B. A., Stuart, M. J., & Dahm, D. L. (2017). Return to sport: Does excellent 6-month strength and function following ACL reconstruction predict midterm outcomes?. Knee surgery, sports traumatology, arthroscopy, 25(5), 1356-1363.